Mr. Marlow was born in Denver, Colorado and raised near Chicago, Illinois. He has a long family history in Denver; his grandmother graduated from North High School and his mother graduated from East High School and the University of Denver. 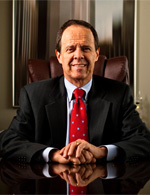 Mr. Marlow began his legal career with the firm in 1978 while still in law school. He has extensive business, financial and tax experience which provides a practical approach to the areas of estate planning (wills and trusts), estate and trust administration, business entity formation (corporations, partnerships, limited liability companies, etc. ), business and real estate transactions (purchases, sales, mergers, etc. ), retirement planning, and nonprofit and tax-exempt organizations (formation, tax qualification and operational issues). He offers straightforward techniques and strategies to accomplish each client’s objectives.